An article published earlier in the month at Indy100 (The Independent’s BuzzFeed–style website featuring ‘click bait’ and viral content) highlighting photos from around the world of Muslims celebrating the festival of Eid al-Adha. 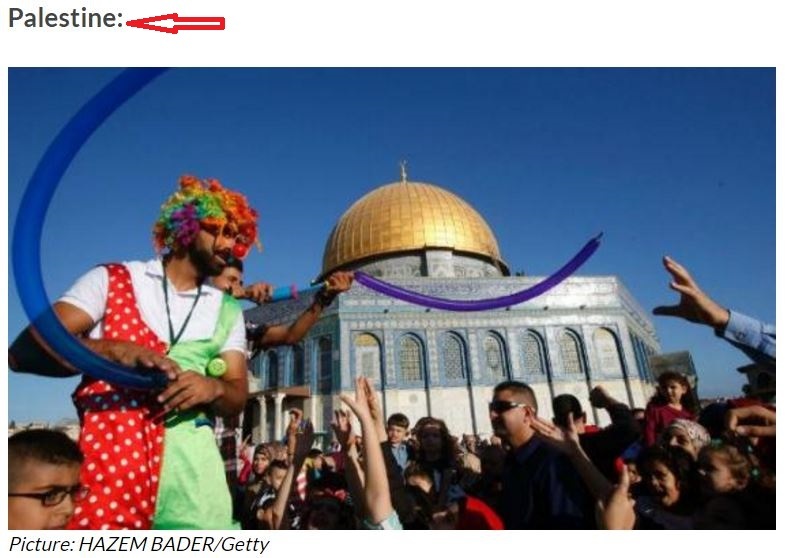 Here’s a snapshot of one of the Eid al-Adha celebrations across the globe featured in the story written by the virulently anti-Israel Indy100 journalist Narjas Zatat. The photo shown depicts the Dome of the Rock, located on the Temple Mount in Jerusalem, built in the 7th century CE on the spot where the Jewish Temples had stood. Though the Temple Mount (Judaism’s holiest site) is administered by Jordan’s Islamic Waqf, and future control of these holy sites (as with the rest of “east” Jerusalem) is in dispute, under the current status quo Israel retains sovereignty and security control of the area. It’s no more accurate to claim that the Temple Mount is in “Palestine” than it would be to characterize neighborhoods in “east” Jerusalem (due to Palestinian claims on these neighborhoods) as located in “Palestine” – a country, of course, which currently doesn’t exist. In fact, in other articles on the same topic, The Independent typically has described the location of the Temple Mount (more neutrally) as “the Old City in Jerusalem”. It’s simply not accurate to list the location of the Temple Mount as “Palestine”, and we’ve complained to editors seeking a correction. Hinde Street Church: Now, take down that wall!